Orion Live Ink Character Recognition (OLICR) is a proprietary data capturing solution comprising a digital pen* embedded with Live Ink Character Recognition (LICR) technology that digitally captures handwritten numeric data with 100% accuracy**. OLICR securely captures data as you write in real time using a patented digital pen* paired with a standard tablet (iPadTM/AndroidTM/WindowsTM) device that transmits it to the server or cloud with encryption, instantaneously. It eliminates the time and cost of scanning to digitize data while minimizing chances of human errors. Its ease of use makes it an ideal solution for automation of paper driven processes such as field services, surveys, registration forms, etc. that comprise digitization of handwritten data. 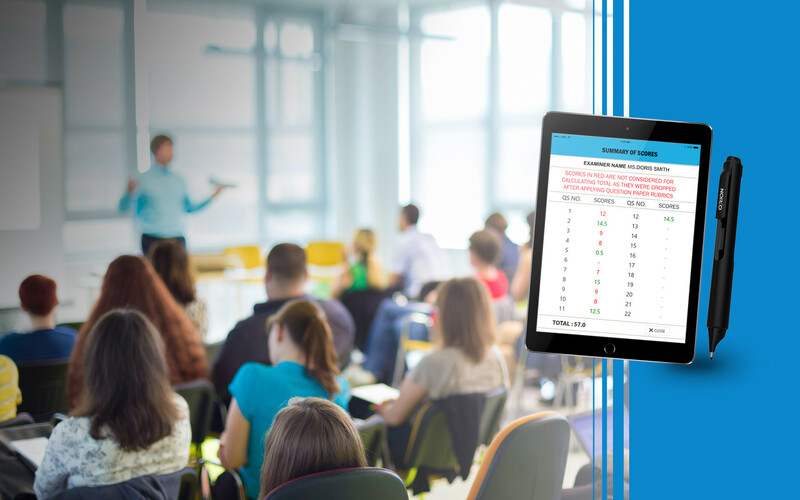 Video: Learn how OLICR simplifies the examination assessment process and accelerates results declaration for education providers. Want to give OLICR a try? The education industry is rapidly changing the way it uses technology. With improved interoperability, accessibility and delivery of information services, the industry is embracing the transition to a digital future. Orion Education Solutions assist education institutions to redefine the governance, business processes and students’ learning experience to move beyond the confines of traditional operating models. Click here to learn more about our out-of-the-box technology solutions that are transforming the way educational institutes function today. Collecting personal data is a critical function for banking, insurance and financial companies as it not just directly impacts their business governance and service but acts a key to building strong customer relationships. However, financial organizations are grappling with this complex and time-consuming process due to lack of standard procedures and prevalence of conventional pen and paper methods. With OLICR, the steps involved in customer on-boarding can be drastically reduced and activation could be completed without any waiting period. OLICR can convert data into a digital format and safely transfer it back to the main branch, all in real-time. With no learning curve and minimum upfront investments, the solution can be rolled out swiftly utilizing organizations’ existing infrastructure. Government and Public Sector organizations require a robust document digitization process that can streamline paper-based transactions while eliminating tasks such as scanning and re-keying of information. However with conventional data capture methods, the biggest challenge is dealing with large volumes of paper and complex document processing workflow along with lack of skilled staff and their reluctance to adapt to the new technologies. OLICR address the above concerns effectively by helping government and public sector organization establish a data capture process that leverage traditional pen and paper method. The solution enables field as well as office staff to reduces efforts required for managing a huge volumes of paper-work while streamlining digitization of documents for the citizenry as well as inter-departmental work. Retail and Logistics companies are witnessing a phenomenal rise in demand due to rapid proliferation of online stores. Both, organized and unorganized retails channels are set to grow at a very rapid pace over the next few years. However, expanding the service reach by developing a strong back and front-end supply and logistic networks will require a technology that would capture data accurately and is also quickly adopted by users. Orion’s LICR solution is an apt solution for this emerging need of retail organizations. With a digital pen and tablet, data can be captured remotely and transferred to the main servers via mobile devices to streamline any tasks demanding paperwork. This real time data can be used as a proof of delivery as well to resolve any issues or disputes and subsequently improve customer service. Data Governance is a critical aspect of quality healthcare and also one of the most challenging to manage. To support care delivery and other functions, medical records need to be securely stored and accurately tracked. They must be available to providers at a second’s notice – while, at the same time, remain compliant with Government and State regulations. Capturing this unstructured health information and updating patient records often takes up valuable time of providers that could be utilized to deliver better patient care. OLICR can effectively bridge this gap by enabling data capture in real-time while employing conventional digital pen and paper method. The data can be validated further to ensure corrections could be made before it is submitted to patient records server.